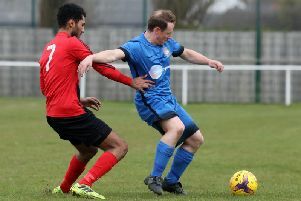 On the early evidence this season, there aren’t going to be many who will enjoy a success when they face Peterborough Sports in the ChromaSport & Trophies United Counties League Premier Division. The newly-promoted side have made a flying start after dominating Division One last season. But Whitworth will be one of those teams who will be able to say they beat them. The Flourmen held Sports to a 2-2 draw after 120 minutes of UCL Knockout Cup action at London Road on Tuesday and then advanced 6-5 in the penalty shoot-out. It was a further example of the “momentum” being gained by Whitworth under new boss James Mallows. And, with his team registering three wins from five Division One matches so far, he is hoping that upward curve can be maintained when they host Bourne Town at London Road this weekend. “The lads played really well,” Mallows said as he reflected on that notable midweek cup success. “We had a few missing and they rested a few but they had most of their stars on the pitch at the end but they couldn’t break us down. “Overall, we have started the season well. We feel like we have got a bit of momentum now that the new players we brought in have bedded into the squad. “Hopefully we can just try to push on this weekend. There are still a few missing and we have lost Cavell Jarvis for at least six weeks after he tore his thigh muscle, which is a big blow for us. Non-league clubs around the country will be taking the opportunity to attract new fans with no Premier League or Championship action due to the international break. It is being carried out with the support of prostate cancer charity Prostate Cancer UK and the Flourmen will be selling Men United pin badges as well as having a bucket collection at London Road. This weekend’s Division One action gets under way tonight (Friday) with a local derby between Thrapston Town and Rushden & Higham United at Chancery Lane. The Lankies claimed an impressive 2-1 victory over Daventry Town in the UCL Knockout Cup on Tuesday night. Tomorrow, Raunds Town and Irchester United face tough away days. The Shopmates go to third-placed Long Buckby while the Romans travel to leaders Oakham United. Burton Park Wanderers’ torrid start continued with an 8-0 defeat at Daventry last weekend and they host Olney Town tomorrow while Stewarts & Lloyds, who were knocked out of the UCL Cup by Kirby Muxloe in midweek, take on Buckingham Town at Occupation Road.